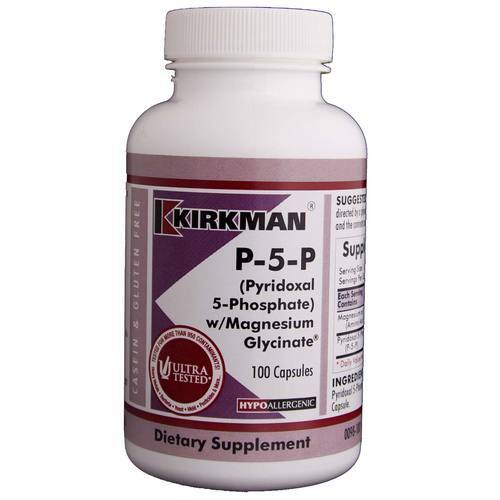 Kirkman Labs P-5-P with Magnesium Glycinate is a hypoallergenic product, great for sensitive individuals. Advertências: Keep out of reach of children. Magnesium supplements can cause changes in stool consistency and bowel habits. If this occurs, discontinue use and discuss this matter with your physician. Notas: Free of sugar, starch, soy, wheat, casein, gluten, milk, egg, preservatives, yeast, gelatin, flavorings, colorings, peanuts, tree nuts or fish. Recomendações de uso: 1 capsules per day or as directed by a physician. Capsule make be pulled apart and the contents mixed with food or beverage.